The psychologist who will accompany the England squad to Brazil for the World Cup finals has likened Liverpool manager Brendan Rodgers to ex-British Cycling team boss Sir Dave Brailsford. Dr Steve Peters has been working closely with title-chasing Liverpool. 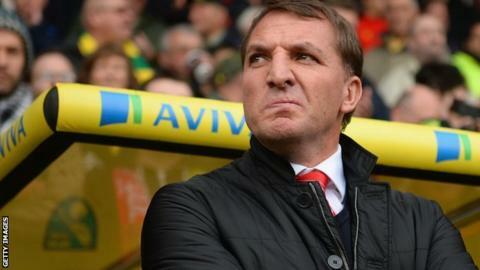 Rodgers has guided the Reds to within touching distance of their first league title in 24 years. Dr Peters told the Radio Times that Rodgers was "very psychologically minded" like Brailsford. Brailsford, 50, led Great Britain to eight gold medals at both the Beijing and London Olympics and transformed the sport during his 10-year reign, before quitting as performance director earlier this month. Dr Peters, who stepped down at the same time as the GB cycling team's psychiatrist, said both men were "very challenging", adding that Rodgers "wants to make sure he's got it right. He will question what I do, engage with it. Dr Peters, who has a long and varied history of assignments, has helped cycling stars such as Tour de France winner Sir Bradley Wiggins and another Olympic gold medallist, Victoria Pendleton. He is credited by Ronnie O'Sullivan as having spurred him to his last two world snooker titles and Liverpool captain Steven Gerrard says he may not have recovered from a career-threatening injury had it not been for the psychologist's help. "I can't make people win," said Dr Peters. "All I can do is, with your help, increase the probability of winning."